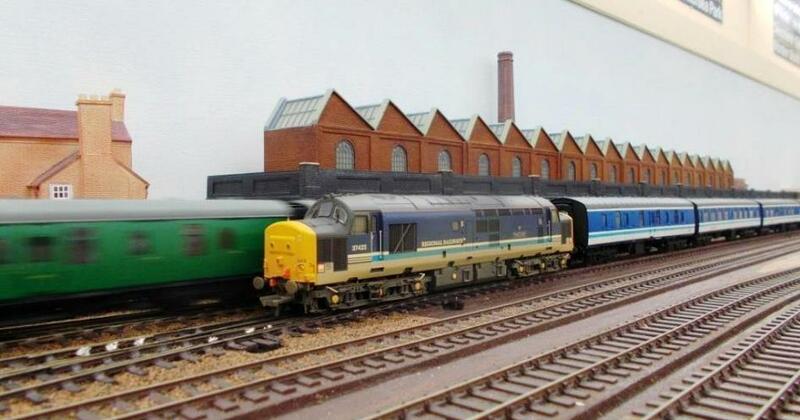 As my current layout (Ewhurst Green) progresses there has been a significant number of running sessions thereon as friends bring their models to run. Indeed, unless stated otherwise all the locomotives featured are visitors; even the Metro-Cammell Pullman set was a visitor - albeit have taken ‘residence’ since 2015! Some of these friends are still building their layouts; others want the opportunity to run full-length trains on somebody else’s metals (i.e. mine). As it stands the longest bogie train has been eighteen behind a Hornby ‘Duke of Gloucester’ visiting from the Algarve; the slowest locomotive a pre-WW1 Prussian 0-8-0 at eighteen minutes eight seconds. This could probably be improved now more-modern controllers are employed. With layout construction ongoing, the vantage points for photographs are currently limited (so apologies here). But these will increase with time – currently layout wiring is a priority as only then can the trackwork be fully tested before more scenery can be added! Typically, these running sessions start with an excellent lunch at ‘our’ nearby beachfront café; which is just a very short distance away! These running sessions are recorded here although past sessions may be dropped off the list as time progresses. We had just got back from lunch at our favourite beach-front café on this sunny April Saturday when there was a sudden deluge of sleet! This running session saw the last day of operation of the eight-car Metro-Cammell Pullman car set; at least for a while as they are being returned to ‘works’ for overhaul; these having been a ‘permanent visitor’ for over three years! A replacement coaching set has been promised – readers will just have to wait and see what arrives! Hauling these Pullman cars was GWR-liveried County class no.1006 ‘County of Cornwall’. With its very distinguishable straight splashers (which led to straight nameplates – not often seen on the GWR) these were the final and most powerful development of the two-cylinder 1901-built Saint Class locomotive. 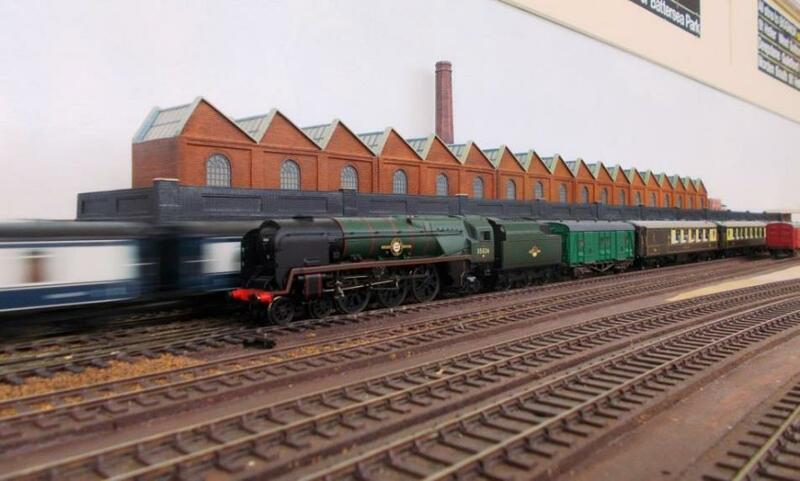 However, the locomotive’s boiler owes its design to Stanier’s 8F; some of which were built at Swindon works for the LMS as part of the war effort. Thirty of these locomotives were built between 1945 and 1947 (all were withdrawn and scrapped in the early 1960s). No.1006 was the second GWR locomotive to carry the name ‘County of Cornwall’; County class no.3824 being the first (built December 1911 - withdrawn March 1931). No.1006 was outshopped in November 1945 and allocated to Laira shed (Plymouth). It was named ‘County of Cornwall’ in April 1948, thence was equipped with a modified double chimney in December 1958. Allocated to Penzance in March 1959 it was withdrawn from Swindon in September 1963 to be scrapped at Cooper Metals, Sharpness. Initially this model ran very poorly; quickly solved by a straightforward strip-down of the locomotive to correct the back-to-back dimensions of the wheelsets. Contained within Hornby’s Railroad range, this is a nice model that hauls eight coaches with ease. Hopefully it will soon make a reappearance. EWS 66 068 hauling a container train on the Down Line. General Motors’ Electro-Motive Diesel (EMD) Class 66 (or JT42CWR) were specifically built for the European heavy freight market. Designed for use with the United Kingdom’s loading gauge these were a development of the class 59; a significant (but not obvious) difference being the use of steerable axles. Adapted and certified for use on other European railways, forty of these locomotives were also sold to Egyptian Railways for passenger operation. 66 068 was outshopped in February 1999 to works no.968702-068. It was originally intended for this model to be made for a model shop as a limited edition. However, when that order was cancelled Bachmann produced it for general release. Ashford-allocated Southern express-passenger ‘Schools’ V class no.30932 ‘Blundells’ in mixed traffic black livery which it received in February 1951. The British Rail Board considered the 4-4-0 wheel arrangement to be obsolete so did not warrant anything more than lined black livery. However, from July 1956 the ‘Schools’ class were able to be repainted in BR Green; no.30932 was just one of four to be withdrawn still in BR black livery (the others being 30900, 30914 and 30919). Up until 1956 no.30932 was paired with a high-sided self-trimming tender (no.732). During 1958 repainting the tender was outshopped in green (an error apparently) so was swapped with early-crest tender no.705 on 30905 ‘Tonbridge’ as that locomotive was being outshopped in BR Green. It has not been ascertained if tender no.705 subsequently received a late-crest but (subject to confirmation) the time period for this model is August 1958; possibly right through to February 1961. No.30932 did not appear to be ever equipped either with AWS or a speedometer. Hauling a container train, the unusual livery of 66 720 came about after GBrf held a competition for their employee’s children to design a locomotive livery. Unveiled in July 2011, the winning entry was provided by six-year-old Emily Goodman, who submitted two alternative designs. So striking were Emily’s designs, both were selected for 66 720 (previously in Metronet livery) and applied using specially commissioned vinyls. Nicknamed ‘Rainbow’ livery, one side depicts ‘night’ <image above> includes the moon, a shooting star and an alien, the other side ‘day’ <image below>; featuring the sun, birds in flight and a rainbow. Type JB no.73 105 in British Rail large-logo livery hauling the Metro-Cammell Pullman set on the Up Main whilst the container train chunters past on the Down Main. Built by English Electric at Newton-le-Willows in 1965-1967, the type JB followed the earlier six-number type JA electro-diesel locomotives. Equipped with dual-controls, essentially the type JA were a diesel locomotive at could operate as an electric locomotive; the type JB were and electric locomotive that could operate as a diesel locomotive. Introduced as E6011, in 2016 no.73 105 was equipped with a new MTU V8 engine as part of its conversion to Class 73/9 by Brush Traction (Loughborough) and currently operates on the Caledonian Sleeper services in Scotland as 73 968. No.73 105 had received large-logo livery by 1985. However, this was relatively short-lived for it was repainted into Civil Engineer’s ‘Dutch’ livery during 1990. Later it entered into NSE’s ‘civil engineering’ department. A warm sunny day brought many down to the seaside; fortunately, we always have a table booked at our favourite beach-front café just a short distance away! 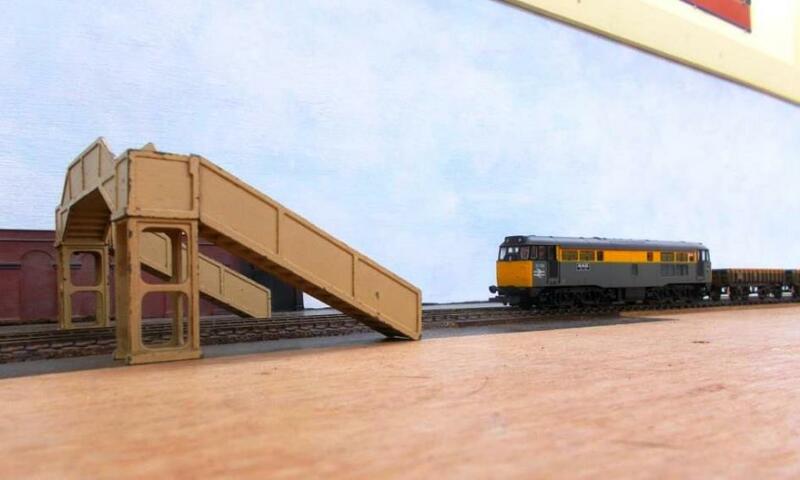 With rolling stock being unpacked, resident visiting SLW stereo-sound model of 24 081 hauls the 8-car Metro-Cammell set (also a resident visitor) around from the storage loops on the Up Line. 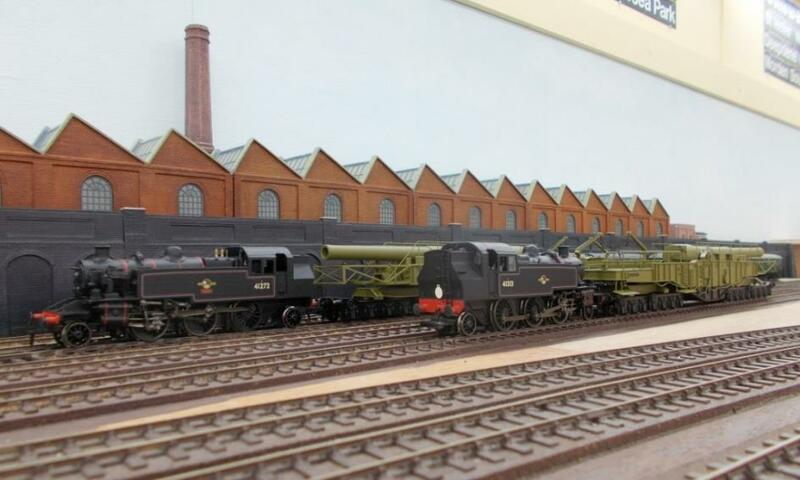 These locomotives are superb models with an exceptional level of detail that challenged many existing models. On the Down Line S15 no.30830 takes charge of the coal train. Built at Eastleigh in August 1927 as E830, it was renumbered 830 in September 1932 thence 30830 in March 1950 when it received the ‘Unicycling Lion’ emblem. On 11th July 1959 it was outshopped with a later emblem (as modelled) before withdrawal on 26th July 1964. Both tender and locomotive survive (separately) in preservation. 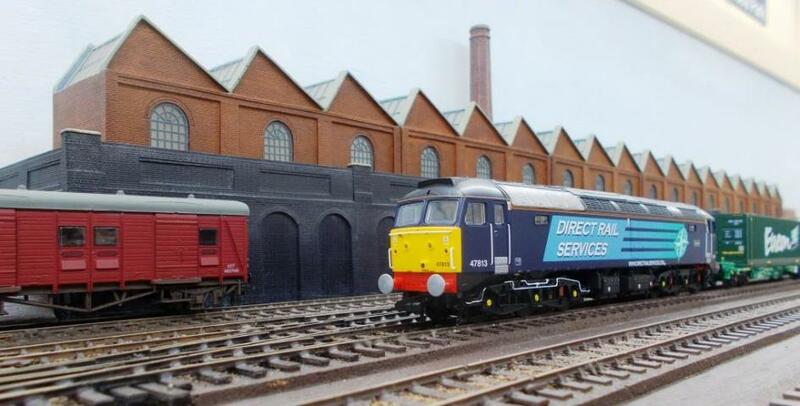 D7672 ‘Tamworth Castle’ was Bachmann’s first class 25 model. Entering service on 25th February 1967 on BR’s Nottingham Division (D16) D7672 was renumbered 25 322 under TOPS in April 1974 before being renumbered 25 912 on 20th November 1985 (sub-class 25/9) finally taken out of service 23rd March 1987. Classified as a Departmental locomotive (and not intended to run under its own power) it was allocated (but never carried) ADB 968027 for use as a training locomotive. During 1988 a decision was made to return the locomotive to running condition and repainted into sixties two tone-green livery. At a small ceremony on 24th April 1989, D7672 (with nameplates ‘Tamworth Castle’) was unveiled and handed over to the ER training department. On 27th May 1990 in two-tone green (a livery it had never previously carried) D7672 hauled a passenger train solo (York to Leeds via Harrogate section of a charter train). GWR class 2251 Collett goods locomotive no.3217 coped admirably with the thirty-wagon coal train. This class was introduced from 1930 with no.3217 being outshopped from Swindon Works to lot no.360 on 31st December 1947 thence to Didcot shed. It was withdrawn from Severn Tunnel Junction shed (86E) on 31st October 1963 and recorded as being cut at Cashmore’s yard (Newport) on 31st December 1964. Class 20 063 took over the coal train running cab-forward. Introduced in the number ranges D8000–D8199 and D8300–D8327, some 228 locomotives in the class were built by English Electric between 1957 and 1968. Producing 1,000 horsepower, these 73-tonne ‘type-1’ locomotives were designed to operate at up to 75 mph; intended for light mixed freight traffic they had no train heating facilities. Rebuilt Bullied Pacific no.34046 ‘Westward Ho’. Interestingly ‘Westward Ho! is the United Kingdom’s only town to have an exclamation mark in its name. However, this was not carried by this locomotive, its model being photographed in the late afternoon sunlight as a coal train rattles past on the Down Line. With the sun quickly dropping below the horizon 20 172 and 20 063 were placed on the coal train; this pairing being typical as it doubled the available horse-power of these type-1 locomotives whilst always giving drivers an improved forward view. No. 20172 ‘Redmire’ entered service as D8172 in October 1966, being allocated to the London Midland Nottingham Division (D16). In 1974 it became 20 172 under TOPS before receiving the name ‘Redmire’ (after the North Yorkshire village). Carrying a variation of BR's Corporate Blue livery (as applied by Thornaby TMD) with red solebars, yellow ends and large number 20 172 being applied to the bonnet doors (instead of the cab-sides). Thornaby also added their Kingfisher monogram. Allocated to Toton TMD in the late 1980s, no.20 172 was withdrawn in October 1990 and recorded as being cut by M.C. Metals (Glasgow) in March 1995. 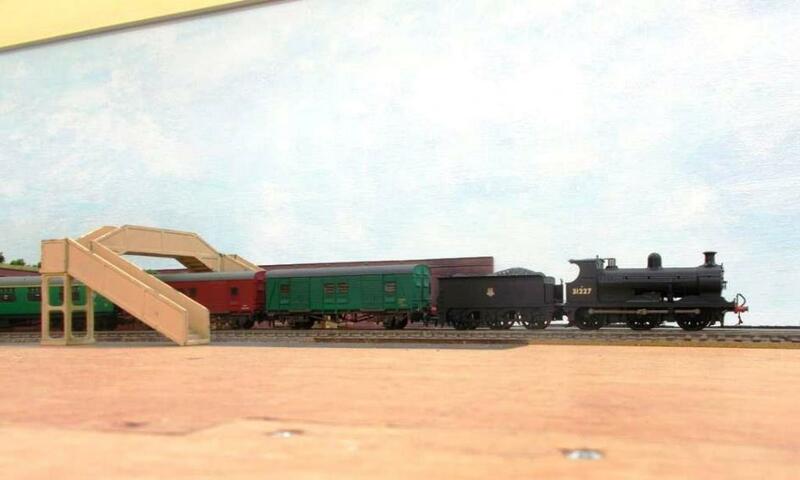 Neither the coal train or SR ‘Queen Mary’ brake van on its rear were visitors to the layout. As previously identified from an earlier running session, the coal wagons were the original Mainline models repainted, individually numbered and distressed albeit many years ago. Both couplings and wheelsets were replaced with modern mini-couplings and Jackson (now Romford /Markits) wheels. Although Ewhurst Green is an analogue layout, it has been run using a DCC controller. The latest Hornby Lord Nelson (30850 ‘Lord Nelson’) is DCC sound-equipped and does not come with DC running enabled (the chip has to be reset to CV29 code 6). So, on this session a DCC controller was brought along with a view to resetting some visiting DCC locomotive to run on DC as well. Visiting 30863 ‘Lord Rodney’ hauling the 8-car Metro-Cammell Pullman set passes N-class 31869 (on the Branch reversible) and LN 30850 ‘Lord Nelson’ (on the Down Headshunt). Whilst the chip of no.30850 had just been reset to enable DC running the DCC N-class 31869 remained DCC only; it is understood this was as a consequence of the split-chassis conversion to DCC. On the Down Line the Banana van train had been replaced by a 30-wagon (plus brake-van) coal train; these being the original Mainline steel mineral wagons repainted grey, given individual numbers and hand weathered. The load is real coal glued sieved and glued on (then) Parkside Dundas inserts. Originally allocated to Shrewsbury (October 1951) BR standard ‘4’ no.75008 went to Cardiff (Canton) (October 1953), Oxford (October 1958), Templecombe (July 1964), Exmouth Junction (September 1964) and finally Worcester (June 1965). 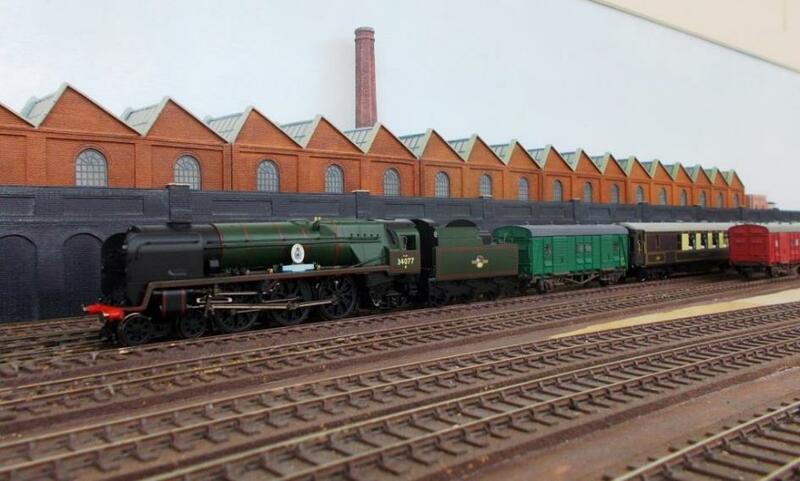 It is believed to have received green livery in June 1957 at Swindon works. A 7-car train of Maroon Mk1 stock appeared initially behind Merchant Navy class no.35020 ‘Bibby Line’ as it appeared between April 1956 and May 1961 although red-ground nameplates didn’t normally re-appear until 1962-on. On the Down Line a coal train rattles past. At some point BR standard ‘3MT’ no.82005 took charge of the coal train. It is understood this 2-6-2 tank acquired green livery in June 1958 being lined by September 1962. Originally at Tyseley shed (from May 1952) it had reached Chester (GW) shed July 1958 (via Barry, Newton Abbot, Treherbert & Bristol (Bath Road) sheds) before moving next to Chester (LM) in April 1960, Shrewsbury - April 1961, Machynlleth – July 1961, Shrewsbury – October 1961, Machynlleth - November 1961 and finally Nine Elms in April 1965. Lord Nelson class 30863 ‘Lord Rodney’ took charge of the 7-car train of Maroon Mk1 stock. The red ground nameplates would suggest this model is in c.1949-1952 livery so would look more at home hauling SR green or CLC livery stock; maroon not widely appearing until 1956-on. Two Bachmann Sulzer type 2 locomotives (TOPS class 25) had their DCC chips checked for DC compatibility before being placed in charge of the coal train. No. 25 034 leads 24 095. Built at BR Darlington Locomotive Works locomotive no.25 034 was (as D5184) allocated new to Toton (18A) on 4th May 1963. 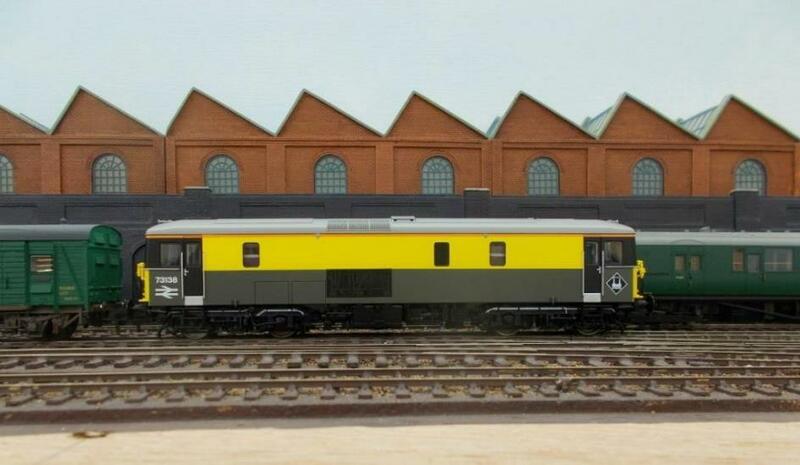 It was withdrawn after twenty-three years and eight-months (including a lengthy period out of service during 1983/84) having been allocated to depots on both the London Midland, Eastern & Scottish Regions. Built at BR Derby Locomotive Works locomotive no.25 095 was (as D5254) allocated new to Toton (16A) on 21st January 1964. 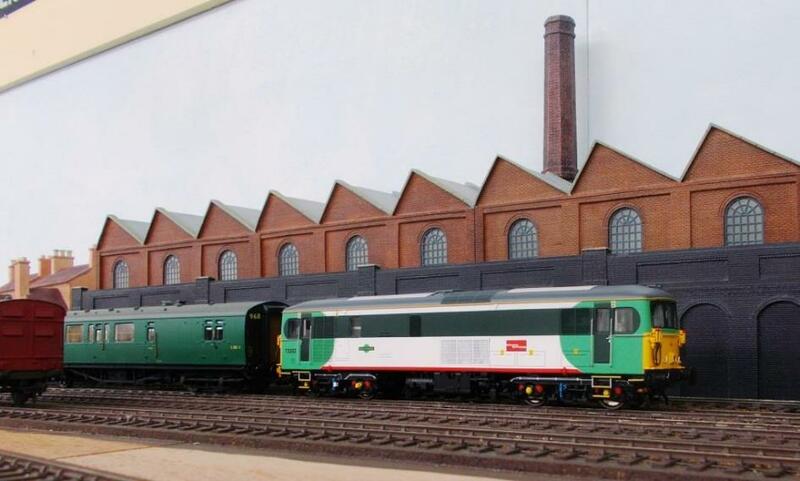 It was withdrawn after twenty-two years and six-months having been allocated London Midland Region depots save a brief period on the Southern Region between September and December 1964. Although a running session wasn’t scheduled, the model railway exhibition we’d all gone to visit was not of particularly good quality (entirely let down by poor organisation /management) so we retired into AA Milne territory for lunch at a café that is well-known for its excellent home-made quiches. Unlike the exhibition; we were not disappointed! With one member purchasing a locomotive at the show and a (now) free afternoon an impromptu running session was requested! The purchase was 9F no.92220 ‘Evening Star’; this being the last steam locomotive for British Railways (outshopped March 1960) and the only Class 9F to be named / liveried in lined passenger green. It is a fine model and copes well with heavy loads although in this case was given a light load and some gently running-in. The name ‘Evening Star’ was selected from a 1959-60 competition in the BR Western Region Staff Magazine; there being three competition, Driver T.M. Phillips (Aberystwyth), F.L. Pugh (Paddington) and Boilermaker J.S. Sathi (Old Oak Common). One of our group has a Scottish interest and his models always create much interest. In this instance his newly-acquired DBSO leading six Mk3 coaches propelled by Scotrail class 47 no.47 710 ‘Sir Walter Scott’ hurried around the Up line at an eye-watering speed. The Mk3 coaches being Jouef, equipped with finescale (Alan Gibson) wheels. Since 1957 the Glasgow Queen Street to Edinburgh Waverley via Falkirk (via Haymarket and Falkirk High) had been operated by Swindon Inter-City DMU units. In May 1971 these services were upgraded with the introduction of push-pull operation using sets of Mk2 coaches sandwiched between pairs of class 27 locomotives. 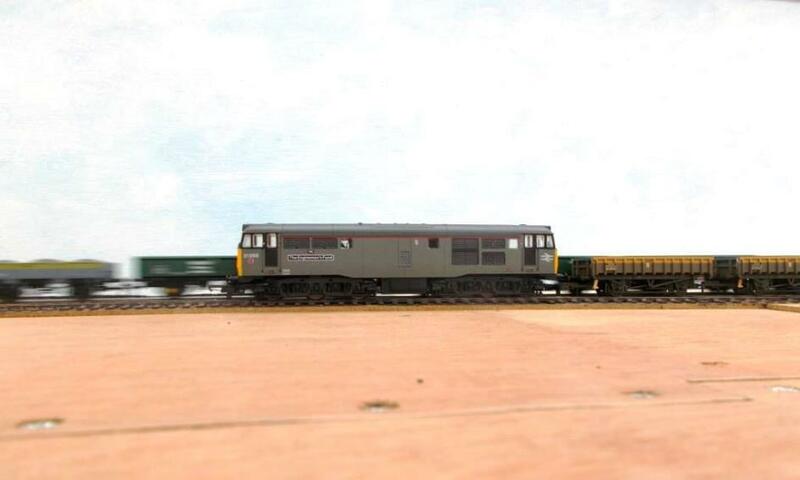 However, running at (up to) 90 mile/hr on a 30-minute interval service was taking its toll on the class 27 locomotives and these were replaced in 1980 with DBSO MK2 driving van trailers, Mk3 coaches hauled /pushed by class 47/7 locomotives. In 1984 one of these sets was involved in the Polmont derailment, where a train (with DBSO leading) hit a cow on the track, resulted in 13 fatalities and 61 injuries. It led to a debate about the safety of push-pull trains although such operation had already been in use for most of the century including (from 1967) quite extensively between Bournemouth and Weymouth. Having had several hours of running-in, no.92220 was placed behind the ‘permanent’ visiting eight-car Metro-Cammell Pullman car set; a load it hauled with ease. 92220 was used over both the Western Region and Somerset & Dorset Joint Railway line. Whilst its main duties were those of a heavy freight locomotive it is understood 92220 was the used on the up Red Dragon and the down Capitals United Express between Cardiff and Paddington, allegedly having to delay its arrival at Paddington to allow for completion of restaurant services because it was running ahead of time! 47 710 was placed in charge of the ‘banana’ train; a relatively modest load for a Brush Type 4. Built at Brush Falcon Works and into traffic 15th April 1966 as D1939, it received the number 47 710 in October 1979. It was named (without ceremony) at Haymarket TMD around 20th September 1979. However, the loco was noted inside Crewe Works on September 22nd, with nameplates fitted but still numbered 47 496. The nameplates were removed in October 1990. Numbered D8400-D8409 and built at their Queen's Park Works (Glasgow) between May and September 1958 just ten North British Type 1 (later classified Class 16 under TOPS) were delivered to Devons Road depot (Bow). Like other Type 1 designs, they were relatively small locomotives intended primarily for local freight traffic. Powered by an 800 hp Paxman 16YHXL engine the design was not a success with inadequate ventilation leading to frequent engine seizures and coolant contamination of the oil (due to cylinder head failure). Fitted with an unreliable non-standard type of electro-magnetic control equipment (coded "red circle" by BR) they were withdrawn in 1968 and scrapped the following year. 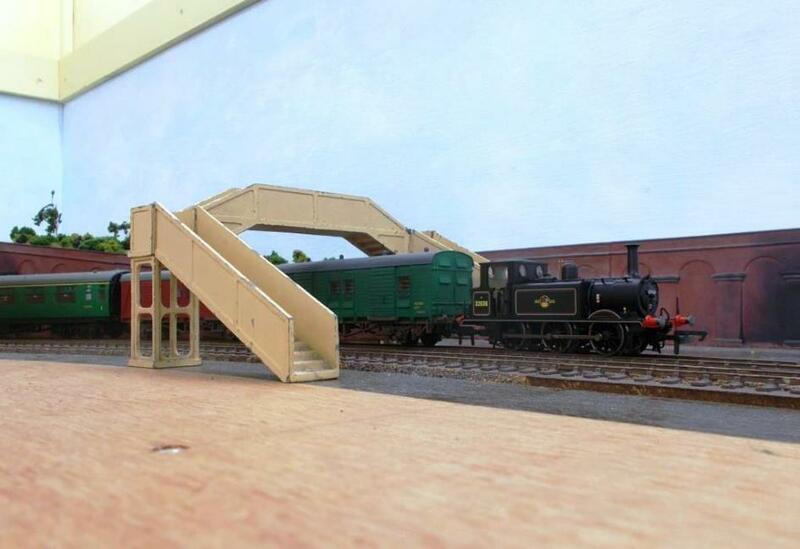 However, once ensconced in the modelling room the track was flooded with engineering wagons – there being two trains put on the tracks - one on the Up; the other on the Down Line! 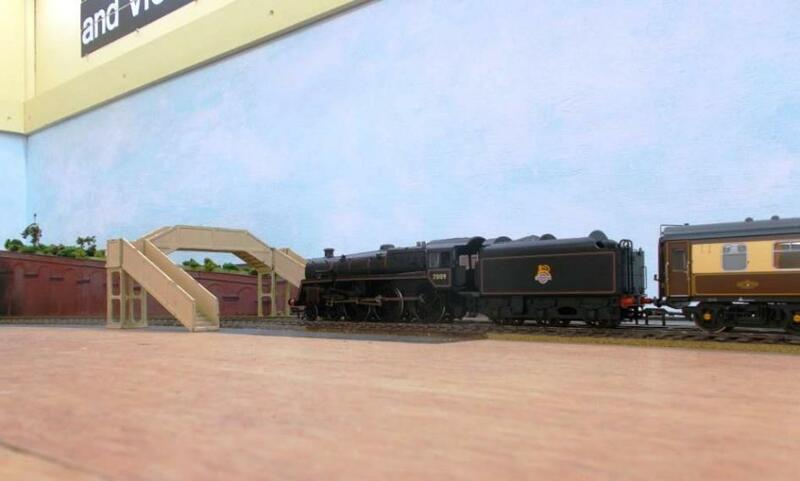 Clams and Rudds were both introduced in 1989 for ballast, spoil and sleepers. They had new bodies on underframes reclaimed from hopper wagons. Unlike Rudds (which were introduced at the same time), Clams had fixed sides and ends and retained vacuum brakes. Dogfish 24-ton wagons (and the similar but smaller 19-ton Catfish ZEV) were designed and introduced in 1955 specifically for the use by Civil Engineering Departments to carry new track ballast direct from quarries to worksite where it could be deposited at a controlled rate. These wagons have three independently controlled chutes (one to each side and another in the centre) operated by large handwheels mounted at one end of the hopper (hence the platform with guardrails). All Dogfish wagons were built with vacuum brakes and carried the 'DB' number-prefix from new. Some were TOPS-coded ZFW. Initially in engineering black, subsequent liveries were gulf red, olive green, grey/yellow; all Dogfish were withdrawn by 2006. Owing much to the GWR ‘Tunney’ design of wagon, some 4,781 Grampus wagons were built between 1951 and 1961. Whilst some were equipped with vacuum braking most only had a handbrake. Grampus wagons were used on every Region of British Railways with versions carrying the TOPS codes ZBO, ZBP, ZBQ, ZBR, ZBV & ZBW. Post-1990 TOPS-coded PNA wagons were two-axle open (spoil) wagons being new box bodies on TTA oil tanker wagon underframes. Some two hundred and fifty were built between 1998 – 1999 and numbered CAIB 3600 – CAIB 3849 for lease to Railtrack to undertake infrastructure duties. Based on a 1903 LSWR-design, BR introduced the Walrus (1954), Sealion and Seacow (1971-1974) and Seacow (1981-1982); with the exception of the bogies and braking systems (air) there being few changes between each build. Wagons were designated according to braking - Walrus YGV (vacuum), Sealion YGH (dual vacuum/air) or Seacow YGB (air braked but equipped with a vacuum through-pipe). Those with vacuum piping removed were reclassified YGA. 31 568 ‘The Enginemen's Fund’ on the Up Line. 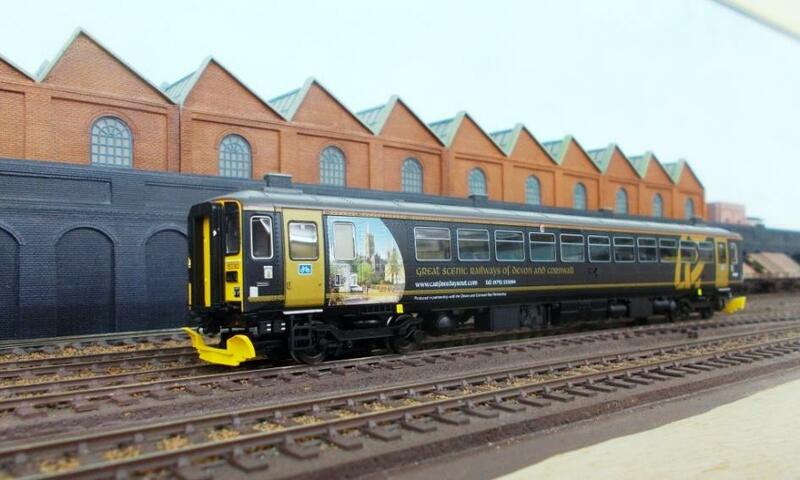 passenger train; this superb model having only just been bought that morning! With a number of Saturday commitments, the 9th February 2019 was the last running session that month. 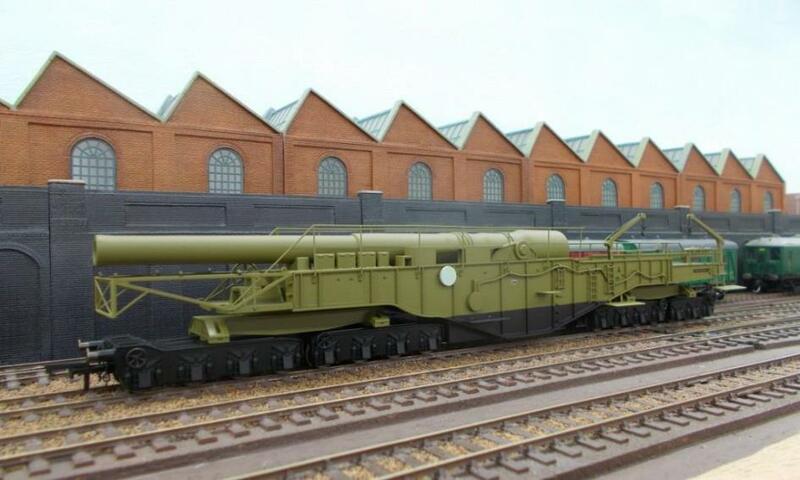 However, some minor shunting still had to take place as two rather large guns needed to be moved as part of their journey from my local model shop in readiness for shipping out to a fellow finescale modeller to defend his model railway in the Algarve! 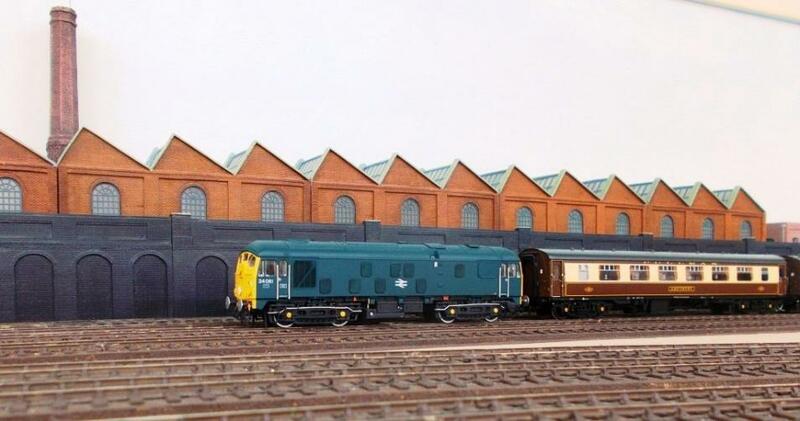 Produced by Oxford Rail, these models are impressive and could only be moved under special conditions on my layout (commencing with the use of railway telegraphic code words OPPOS, CAWSTAB and FABRIC 15). First built for WW1, a number of rail-mounted guns /howitzers were rebuilt for WW2 - intended-use against shipping and (in the event of an invasion) to pound our beaches. At least four railway mountings were rebuilt; three to accommodate Breach Loading 13.5in Mk. V naval guns acquired from the old Iron Duke-class battleships; these naval guns having a 13.5-mile range. These three rail-mounted guns were named H.M.G. Gladiator, Scene Shifter and Piece Maker; being outshopped between September 1940 and May 1941. The size of these wagons is clearly apparent when compared to the crimson lake CCT behind. A fourth gun named Boche-Buster was kept at Bishop Park Tunnel on the Elham Valley Line. With a 12.5-mile range it was essentially intended to cover the north-Kent beaches. The lightly-constructed railway had to undergo much strengthening work (track and structures to accommodate its 250-ton weight. Besides the stepboards, gauging issues include the centre-throw, end-throw and overall height. The wagons are mounted on three-number four-axle trucks and one-number three-axle truck. H.M.G. Gladiator, Scene Shifter and Piece Maker were deployed with the Royal Marine Siege Regiment at Dover and were used on artillery exchanges over the English Channel. However, with significant operational and range limitations they were soon considered as not being nearly as effective as fixed coastal guns and in November 1943 all four of these rail-mounted guns were redeployed for army training purposes. Although sunny, looking out of the café’s windows the wind was really whipping up the waves! More interestingly, our lunchtime discussion revealed a ‘Regional Railways’ bias to the afternoon’s running session - we were not to be disappointed! No.31 455 ‘Our Eli’ is a Lima model mounted on a Hornby Railroad underframe and bogies. Initially it derailed which was soon found to be down to two factory faults (1) the centre wheelsets were not fitted correctly and (2) the back-to-back dimensions were incorrectly set. After these were corrected (a relatively straightforward exercise) the locomotive rain without incident although could benefit from the fitting of Ultrascale wheels. A limited edition of 850, class 37 414 ‘Cathays C +W Works 1846-1993’ is a Lima model that really requires Ultracale wheels (else a ViTrains replacement locomotive). Located in a Cardiff suburb, Cathays railways works built by the Taff Vale Railway to provide its main carriage and wagon works along with a railway depot for its system. 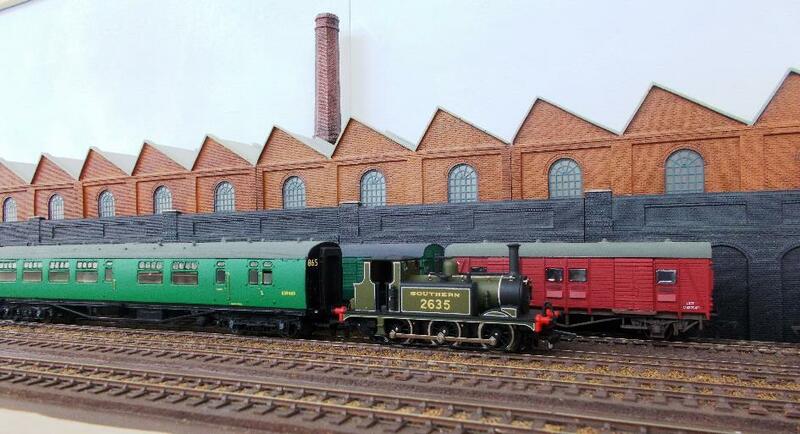 It passed into Great Western Railway ownership thence British Railways who sold off the carriage and wagon works to the Pullman Company Ltd. Today, both the site of the railway depot and the carriage and wagon works have been redeveloped. The Lima class 37 model (above) looks dated against Bachmann’s 37 422 ‘Robert F. Fairlie Locomotive Engineer 1830-1885’. Robert Francis Fairlie was a railway engineer known for his patented double engines; the Double Fairlie locomotives having been associated with the Ffestiniog Railway since the 1870s. Brush ‘Type 4’ no.47 475 was painted in the original Provincial services livery in order to match the Transpennine Mk.2 coaching stock used on the Newcastle to Liverpool services (which had been similarly re-liveried quite early-on in that sectors' existence). BR standard class 4 no.75062 on a Down passenger train. This locomotive spent time at Nottingham (1957-new), Derby (1962), Stoke-on-Trent (1963), Lostock Hall (1967) before withdrawal from Carnforth in 1968. No.75062 subsequently took charge of the visiting five-car Regional Railways Mk.1 set. These coaches really looked the part and it is understood their next visit may be strengthened by four number Regional Railways-liveried Mk.2 stock. The reason for the locomotive change was to enable ‘C’ class 31579 to take the BR(S) liveried Bulleid /Mk.1 stock. These were a well-designed locomotive; straightforward and reliable. With a good turn of speed (for an 0-6-0) they found work not just on goods trains but semi-fast passenger trains too. Accordingly, they saw widespread use across the Eastern Section. In 1900 the first two C-class locomotives appeared from Ashford Works and Neilson Reid respectively. Up to 1908 a further 107 locomotives were delivered from Ashford Works, Longhedge Works, Neilson Reid & Co. and Sharp Stewart. They endured well with the last being withdrawn from passenger service in 1962. Based on the LMS ’Fairburn’ design and built at Brighton locomotive works to work order BR.3621 in 1951 (at a cost of £11,025 e.a.) ‘Bacon slicer’ 4MT tank engine no.80032 took on a period Down train. Originally intended for the North Eastern this locomotive was allocated to Brighton shed (75A). With a later crest this locomotive was also allocated to Redhill thence Bournemouth sheds. Loadhaul class 60 locomotives piqued the day’s interest. With a centre of operations in North East England, and South and East Yorkshire, Loadhaul was created in 1994 (along with Transrail and Mainline) as part of the broadly regional split of British Rail's Trainload Freight operations. All three former Trainload Freight companies were acquired in 1996 by 'North-South Railways' (owned by a consortium led by US railroad company Wisconsin Central). Ultimately all three (together with Rail Express Systems) were formed into a new company, English Welsh & Scottish (EWS). 60 070 ‘John Loudon McAdam’ was built at Brush Traction's works in 1991; receiving its name later that year. 60070 was one of only three class 60 locomotives to carry the Loadhaul branding over the existing Railfreight triple grey livery (along with 60 050 and 60 064) instead of Loadhaul’s normal black with orange ends livery. 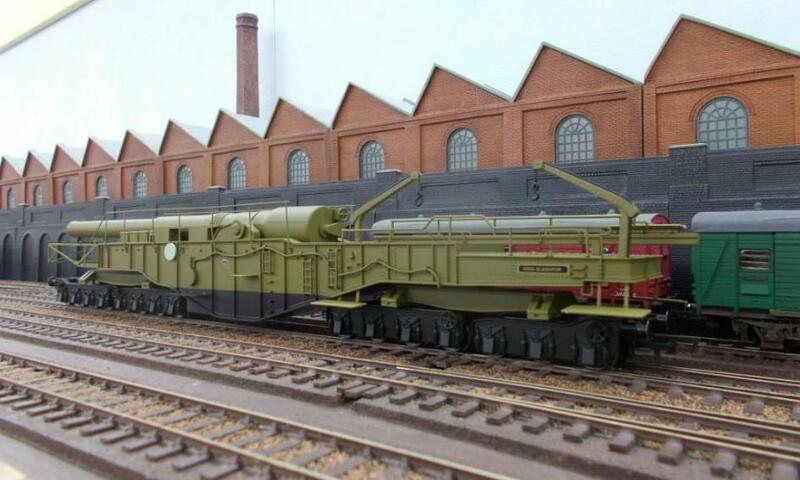 60 070 was placed into storage during 2004; Hornby’s model of same was released in 2018. 60 007 was a Hornby model released in 2005 in Loadhaul black /orange livery. It was not without slight irony that 60 007 once carried the not dissimilar Scottish name ‘Robert Adam’. Type ‘JB’ TOPS numbered 73 138 in Engineer’s ‘Dutch’ livery. This class of 49 locomotives were built in two batches using English Electric components. The first six type 'JA' locomotives numbered E6001-E6006 were built by BR at Eastleigh works in 1962 and were numbered E6001-E6006. With the introduction of TOPS in 1968 these became class 73/0. A successful design of locomotive, the production run of forty-three type 'JB' locomotives were built at English Electric's Vulcan Foundry from 1965 to 1967. Numbered E6007-E6049 they became TOPS class 73/1 and were renumbered 73 101-73 142. Dean Goods no.2468 on the Down Line. Between 1883 and 1899 Swindon railway works built 260 of these William Dean-designed class 2301 goods locomotives These locomotives broke with GWR tradition through having inside frames; the first twenty engines were originally domeless (all subsequently received domed boilers). The class were numbered 2301–2360 and 2381–2580. The running sessions always follow lunch; this day saw a West Country theme albeit starting with my modified Merchant Navy no.35026 ‘Lamport & Holt Line’ essentially undertaking a few circuits as a positioning move from the previous running session. Beattie well tank no.30585 hauling some hooded china-clay wagons. Three of these elderly well-tanks survived into BR-days on the Wenford Bridge branch; two made it into preservation. Pannier tank no.1368 was of the 1366 class; one of only two pannier tank designs built by the GWR that utilised outside cylinders (although various existing engines inherited by the GWR had Pannier Tanks and outside cylinders). Designed to replace the 1392 class, the 1366 class was developed from the 1361 class but differed by including a pannier tank rather than a saddle tank and Belpaire firebox. Six engines of the class all remained in operation at nationalisation in 1948. They were a useful design and because of their light weight and short wheelbase, were often used on dockside branches with sharp curvature (including Weymouth Quay). In 1950 three locomotives were stationed at Swindon and three at Weymouth. By 1958, two still remained at Weymouth (the shed now being under British Railway's Southern Region), one at Taunton with the other three still at Swindon. No.4962 ‘Ragley Hall’ was a 4900 Class or Hall Class; a mixed traffic 4-6-0 type designed by Charles Collett. Following the 1924 prototype a total of 259 locomotives were built through to 1930; these numbered 4900–4999, 5900–5999 and 6900–6958. It had been intended to place no.6988 ‘Swithland Hall’ on a passenger train but as these were a mixed traffic locomotive it took top hauling the visiting china clay wagons instead. Swithland Hall was a 6959 Class or Modified Hall Class; these being a development by Frederick Hawksworth of Charles Collett's earlier design. 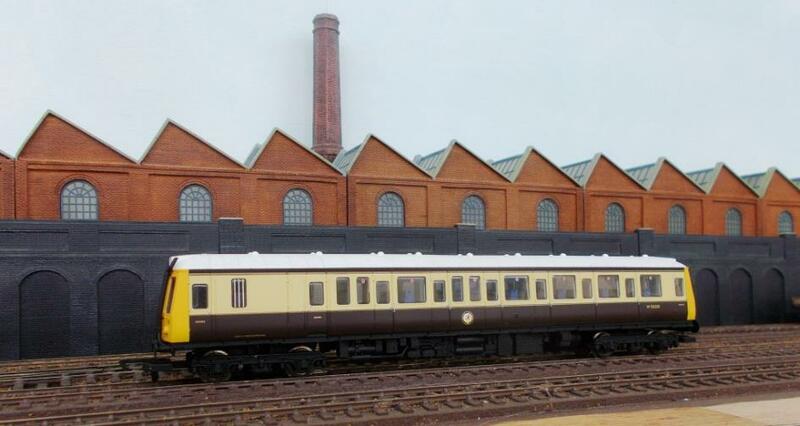 The first batch of twelve Modified Halls was delivered from Swindon works between March and September 1944. They carried plain black livery were unnamed and numbered 6959-6970 (named between 1946 and 1948). A further batch of ten locomotives appeared during October and November 1947 with more on order when the nationalisation took place in 1948. Construction of this class until November 1950; seventy-one examples being constructed. "Baby Warship" D6318 was a diesel-hydraulic locomotive built by the North British Locomotive Company for British Railways’ Western Region of and. Class 22 under TOPS, they were very similar in appearance to the Class 21 diesel-electrics. The nickname Baby Warship related to the similarity in appearance (and internal equipment) to the British Railways class D20/2 (later TOPS class 41) Warship Class. The class 22 locomotives were numbered D6300-D6357. North British Locomotive Company went bankrupt in 1962 and, by the late-sixties withdrawn locomotives were being used to provide spares. Attrition was inevitable and the withdrawals (which had commenced in 1967) finished with the withdrawal of 6333, 6336, 6338 and 6339 in January 1972. None survived. The first luncheon of 2019 at our local beachfront café hosted discussion of the running session to come. Running commenced on the Down Line with one of my locomotives, modified Merchant Navy no.35026 ‘Lamport & Holt Line’. After modification in 1957 this -crest locomotive was paired with a 5100-gallon early-crest tender until November 1961 when this was changed for a 6000-gallon late-crest tender. Air-smoothed 34001 ‘Exeter’ with narrow cab and 4500-gallon tender (as it appeared between 1949 and 1957) took charge of the eight-car Metro-Cammell Pullman train (itself a visitor). This was the first of the West Country class locomotives entering traffic in 1945; it was withdrawn and cut in 1967. Schools ‘V’ class 30901 ‘Winchester’ as it appeared between 1957 and 1962. During this period, it was a Central Division locomotive based at St Leonards shed until 1958 when it moved to Brighton shed (75A). On the Up Line visiting T9 in Southern livery, which was applied in 1926. 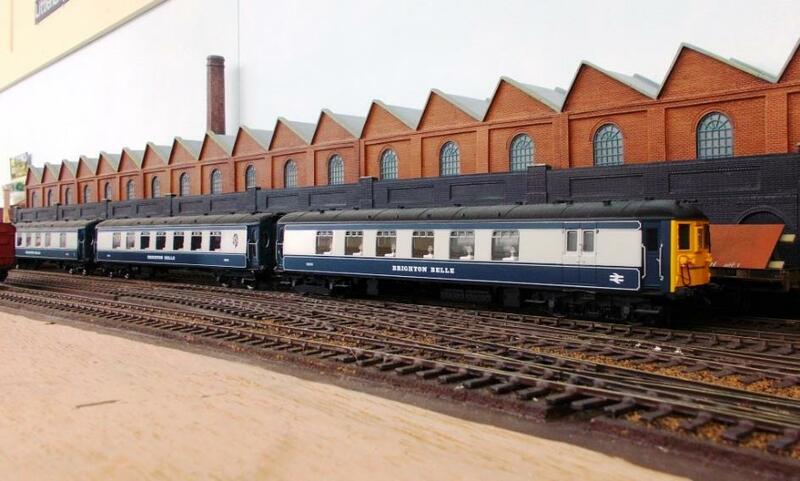 However, the model is modelled as it appeared between 1928 and 1943 (the six-wheeled tender was acquired in 1928 when it also lost the ‘E’ prefix – wartime black was applied in 1943) hauling the Metro-Cammell Pullman cars. Built by Dubs & Co. in January 1900 this locomotive was withdrawn and cut in 1961. Gate stock rattles past on the Down Line. On the Down Line M7 tank engine propels Gate Stock 373. Throughout its life this particular set operated services on the following lines: Bordon – Guildford, Plymouth – Turnchapel, Plymouth – St Budeaux – Tavistock (including Bere Alston – Callington in non-Pull Push mode), Seaton – Seaton Junction and Yeovil Town – Yeovil Junction. Pull-push equipped long-framed M7 tank engine no.30051 as it appeared between 1952 and 1958. For most of this period it was based at Basingstoke shed (70D). Fortunately, the nearby beachfront café reserves tables for its regulars; as the day after Boxing Day the seafront was drawing out the crowds in numbers. The running session was planned over lunch including the upgrading of wheelsets in two class 56 diesels. Built as BREL Crewe as 56 125, locomotive 56 303 is a Mainline model; having been repainted into the short-lived Fastline livery as carried by 56 301 & 56 302. The model’s original wheelsets were unsuitable for scale track. However, Peter’s Spares had Hornby replacements in stock, which had been prepared insofar as the back-to-back dimensions were set to 14.5mm. Bulleid air-smoothed West Country locomotive 21C123 ‘Blackmore Vale’ started out hauling the ‘banana van’ train; these being regularly conveyed on Southern metals to Lingfield in Surrey. The speedometer drive indicates this locomotive is in its preservation livery. Purchased by the Bulleid Preservation Society as 34023, Blackmoor Vale was returned to traffic as no. 21C123 during May 1976 on the Bluebell Railway in Malachite green). Repainted into BR Green during 1984, 34023 was withdrawn from traffic in 1985 with its tender being lent to Battle of Britain class 34072 (257 Squadron) on the Swanage Railway. D6706 entered service in January 1961; it was renumbered 37 798 on 11th September 1986. 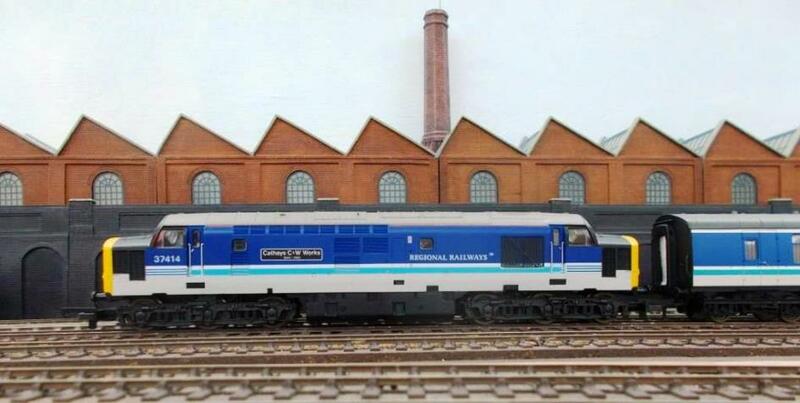 One of the first locomotives to be painted in the bright aircraft blue and silver lining of Mainline Freight, it earned small-time celebrity status by managing to retain its blue livery into the EWS era until scrapping in 2009. 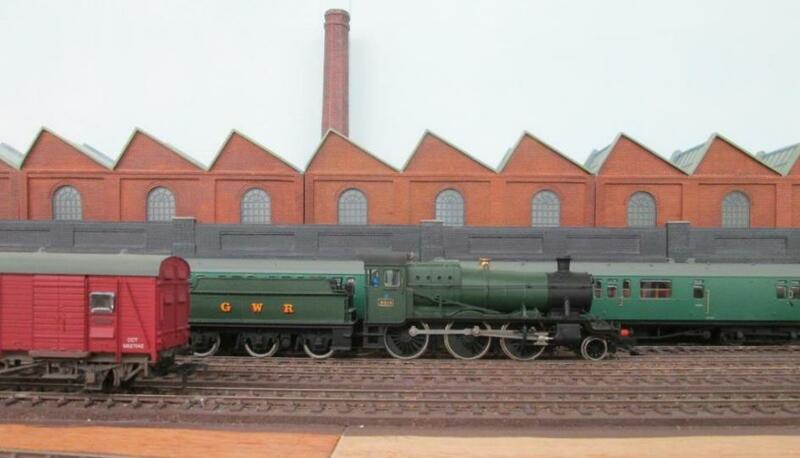 Along with 37 798 locomotive no.37 702 was one of pair ‘Loadhaul models’ produced for Rails Exclusive. On completion of a heavy general overhaul and life extension at Crewe Works, No. 37 702 was allocated to Cardiff Canton shed and found regular employment in the South Wales valleys on merry-go-round coal traffic. Receiving its Taff Merthyr nameplates from a Class 56 in 1989 the Transrail brandings and depot plaques were gained in 1996. During this period, it was fitted with unusual rectangular buffers that are replicated on model. The original wheelsets on Dapol’s model 56 086 were unsuitable for scale track. However, having already purchased wheels for 56 303 Peter’s Spares had just one last complete set of Hornby replacements in stock, which had been prepared insofar as the back-to-back dimensions were set to 14.5mm. Coping well with quite heavy loads, in terms of quality this model still holds its own reasonably well today. Built by BREL Doncaster and is believed to have been scrapped in the late 1990’s. Built 31st October 1938 Crewe Works Black Five no 45458 commenced its working life at Perth South (63A); it was withdrawn 31st December 1962 from Polmadie (66A) and cut at Barnes & Bell, Coatbridge 29th February 1962. During its life 45458 overturned at Wormit in May 1955. It is understood this model is one of Hornby’s rarer Merchant Navies. At the beachfront café a hearty ‘Christmas luncheon’ was consumed by all with much delight; the filling starter and main course was an ample eloquence – nobody ventured to a third course! Certainly this festive meal made a pleasant change from the usual excellent fare. There was a pre-war German trend to the running session, starting with class 39 no. 195 hauling a mixed train of pre-first World War clerestory stock along with both four and six-wheeled coaches from between the wars. A Prussian State Railways ‘P10’ design the first of these three-cylinder locomotives were built in 1922. This two-hundred and sixty-strong class exceeded much of the seventeen-tonne maximum axle-loading of the German rail network. During the afternoon’s running session this Mikado ran over 200 scale miles on the Up Line! While more stock as being unpacked a ‘resident visiting’ and led by unit no.2603 an eight-car 2 HAL /2 BIL formation made an appearance. The 2 BIL unit (at the rear) had experience a derailment earlier in the week; resetting of its wheel’s back-to-back measurement to 14.5mm immediately cured this. On the Down Line a class 78 (no.254) tank engine hauled more pre-first World War clerestory stock; this time an outer-suburban set. These 4-6-4T tank engines were operated by the Deutsche Reichsbahn and Deutsche Bundesbahn. With the earliest dating back to 1912 (Prussian State Railways), these locomotives could run equally fast forwards and backwards enabling them to be operated on return journeys without turning. Whilst the coaches were of a chocolate & cream livery the upper panelling of the composite’s second-class section was light blue instead of cream. This creates a somewhat unusual appearance. In the UK second class was already in decline by 1860. The Midland Railway abolished second class in 1875; the Great Western Railway in 1910, the London and South Western Railway in 1918 and the South Eastern and Chatham Railway in 1923. With the 1938 abolition of second class on the London and North Eastern Railway’s suburban services only the Southern Railway operated second class on its boat trains (in line with the corresponding continental services) through into 1948 and nationalisation. Second class was abolished on 3rd June 1956 (third class was then renamed second class). 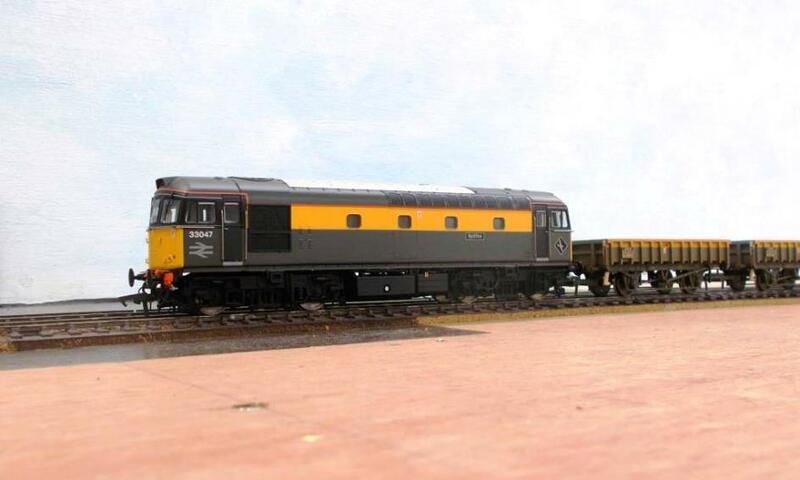 Two van trains were combined on the Up Line enabling a ‘Kernow’ weathered Western D1030 ‘Western Musketeer’ to take charge of a thirty-four vehicle ‘XP’-rated van train. New from Crewe works on 5th December 1963 the locomotive was scrapped just thirteen years later (at Swindon) on 22nd September 1976. Rail blue with small yellow warning panels was adopted in 1966; for a short while D1030 carried a further variation in the form of red headstock /buffer shanks. Besides D1030, locomotive numbers D1017, D1036, D1037, D1043, D1047, D1048 and D1057 also carried small yellow warning panels; other locomotives receiving full-yellow ends. With stormy seas, hail and -2oC temperatures it was fortunate that the beachfront café was warm and welcoming! As rolling stock was being unpacked 5 BEL unit 3053 (itself a resident visitor) took a turn on the Down Line. It was released from Eastleigh on 30th May 1969 in blue /grey livery and made its last schedule run on 30th April 1972. Unit 3053 made a final trip (with 3052) under its own power into Lover’s Walk on 3rd May 1972. Mainline Blue & Silver liveried 58 038 first entered service in 1983; receiving this livery in 1994/95. With a maximum speed of 85mph its design followed American modularisation practice. At the time of this running session 50 038 is currently stored in France. In preservation livery (with modern electrification flashes) King Arthurs class 30777 Sir Lamiel hauled nine bogies with ease. Built in 1925 no.3077 was withdrawn from service in October 1961. The locomotive was named after a fictional minor Knight of the Round Table named Lamiel of Caerdydd (Cardiff). Lamiel is mentioned in Book XIX of Thomas Malory's Le Morte d'Arthur, where it is said he was "a great lover"
Built by Vulcan Foundry in February 1964 and introduced as D6991 this locomotive was initially renumbered as 37 291 before it finally became 37 419 on 3rd December 1985. Running here in EW&S livery no. 37 419 is (at the time of this running session) owned by Direct Rail Services. A Southern Region based locomotive, Ivatt tank no.41291 was originally allocated to Stewart’s Lane (73A) thence Brighton (75A) from April 1961 before moving west to Exmouth Junction (72A) from March 1963 thence to Templecombe (83G) in June 1965 before withdrawal in March 1966. Here it is hauling a four-car Southern Region (plus van) passenger train. Electroputere (Romania)-built Loadhaul 56 003 was one of the class that entered into EWS ownership when that company purchased Loadhaul, Mainline freight and Transrail Freight. The Romanian-built class 56 locomotives suffered from poor construction standards and many underwent extensive rebuilding as a consequence. I believe it was scrapped in the 1990s. These were British Rail’s first diesel type to be built with air train brakes only (Davies and Metcalfe E70 system); earlier designs having variously been fitted with vacuum train brakes or a dual braking system. Compared to a previous running session this is a later Hornby model. Running bunker first hauling a fish train on the Down Line, no.41291 passes a 2 BIL unit speeding past on the Up Line. The session started on the Down Line with Schools class 30915 ‘Brighton’ in its June 1953 ‘Royal train’ guise with white cab roof /smoke deflector lining. In reality this locomotive also sported white-painted tyres /smokebox hinge straps. It is understood this was undertaken for the ‘Derby-day’ Royal Train running from Victoria to Tattenham Corner on Saturday 6th June; just for days after the Coronation. For this duty it is understood the locomotive would have had its leading buffers temporarily replaced with a highly-polished pair. On the Up Line 26 oo2 in Railfreight grey /yellow cab large logo livery as applied to nineteen of the class between 1985-87. Originally delivered to Hornsey (ER) between July 1958 and March 1959 the class moved to Scotland in the 1960s. This locomotive is currently in BR green livery on the Strathspey Railway. 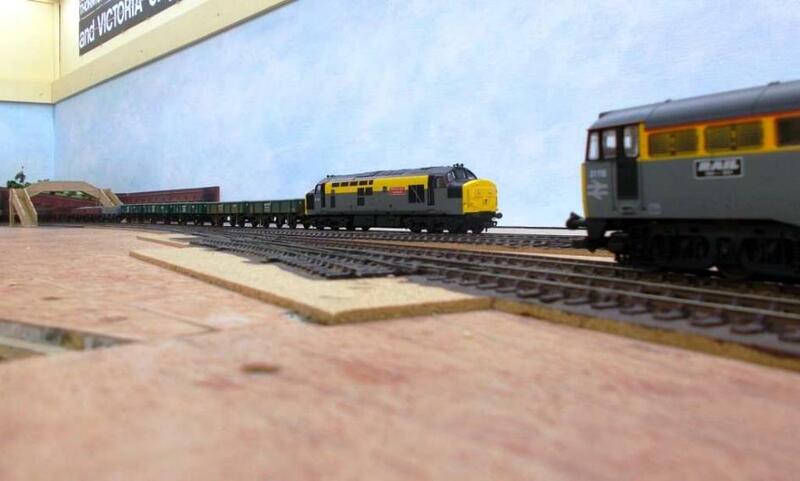 Next on the Down line was ‘P’ class 31323 hauling four bogies with comparative ease. Intended for working light branch and pull-push services eight ‘Wainwright’ P class locomotives were built by Ashford Works between February 1909 and July 1910. With some three-quarters of the tractive effort output from the similar A1X class the class were allocated to light-shunting /shed pilot duties. Withdrawn in March 1960, no.31323 is now at the Bluebell Railway as no.323 ‘Bluebell’; one of four in preservation. This was followed by a change of era with a pair of DEMU’s; no.205001 on the Up Line; 1122 on the Down. Originally number 1101 this unit made its debut at the Eastleigh works open day on 7th August 1957. It commenced its first test running on 12th August 1957 with four trips from Eastleigh to Fareham and back. The first 2H units took over the Portsmouth/Southampton to Salisbury service from 16th September 1957. Renumbered 201001 in August 1986 this unit received (early) NSE livery on 11th May 1988. It survived the Cowden collision on 15th October 1994 before repainting and reduction to a two-car by Connex 18th January 1999. 205001 was last used in main-line traffic on the 18:32hrs Uckfield to East Croydon on 9th December 2004. Entering service on 14th June 1958 unit 1122 was built as a 2H ‘Hastings’ unit for the Ashford ‑ Hastings, Appledore ‑ New Romney and Crowhurst ‑ Bexhill West services. These units lacked the external lighting trunking along the coach roofs but retained the external water filler pipes on the driving trailers. However, 1121 gained external lighting trunking when its identity was exchanged with 1108 in May 1974. 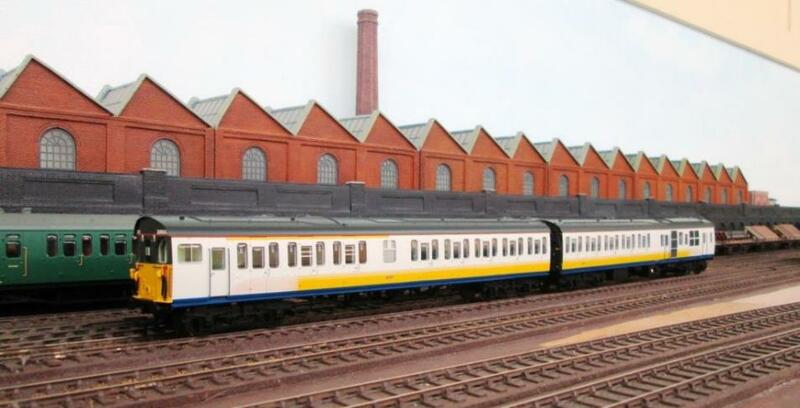 Unit 1122 received blue fill-yellow ends livery on 26th June 1968 before being disbanded to a 3T unit in July 1979. During our seafront luncheon a deal was also struck but more of that later. Perhaps the starting point should be with a couple of GW locomotives, the first being a 57xx class pannier tank no.5775. With a total of 862 constructed between 1929 and 1950 this was the largest class of engine designed and built by the GWR. No. 5775 was built at Swindon in 1929 and withdrawn from Pontypool Road in January 1963 and sold to London Transport taking the number L89. It entered into preservation on the Keighley & Worth Valley railway in January 1970. No.6818 Hardwick Grange was one of eighty 68xx / Grange Class mixed traffic locomotives built at Swindon to replace the 43xx class. They were essentially a Hall-class with smaller driving wheels. Hardwick Grange was one of the first batch of locomotives built between August 1936 and December 1937; a second batch were batch were built between February and May 1939. It was withdrawn in 1964; none of the class survived into preservation. Resident visitor SLW 24 081 has appeared on the layout many times; its excellent stereo sound (even on DC) make it a popular locomotive! 37 501 ‘Teeside Steelmaster’ and 37 ‘British Steel Teeside’ are a boxed pair of locomotives (by Rail Express) that attracted much interest. 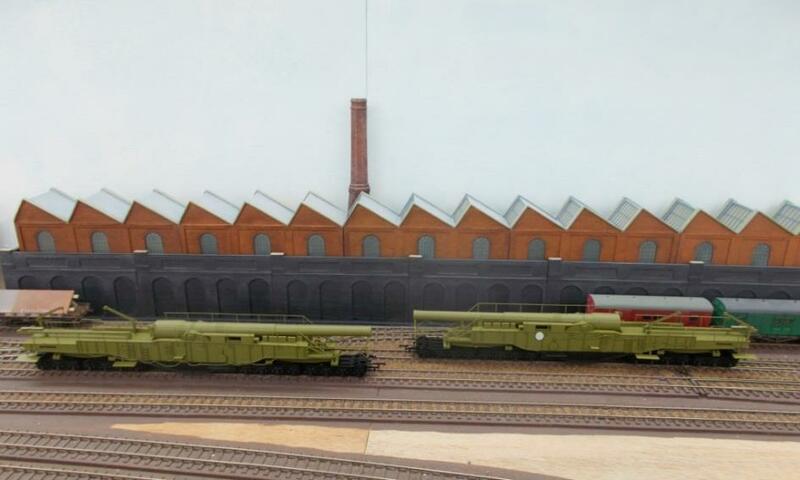 Based at Thornaby in real-life both locomotives being regularly paired. 37 501 ‘Teeside Steelmaster’ is in British Steel light blue livery. 37 502 ‘British Steel Teeside’ carries Teesside depot’s interpretation of Railfreight red strip complete with colour Kingfisher emblem. Scotrail 47 637 entered traffic 24th November 1965 as D1976 before renumbering to 47 274 (September 1974) thence 47 637 (January 1986 in Inter-City livery) and finally 47 826 (May 1989). Whilst in Scotrail livery it was named ‘Springburn’ at BRML Springburn on 16th June 1987. BREL-built Loadhaul 56 083 was one of the class that entered into EWS ownership when that company purchased Loadhaul, Mainline freight and Transrail Freight. I believe it was scrapped in the 1990s. On the Up Line Battle of Britain 34062 ’17 Squadron’ made a welcome appearance presented in its post-1959 modified (rebuilt) guise hauling the 8-car Metro-Cammell Pullman set with ease. The C-class were built between 1900 and 1908 (mostly by Ashford works) and no.31579 took charge of the BR(S) set on the Down Line; all but one of these locomotives made it into BR days with many being withdrawn with the Kent-coast electrification. Next was Merchant Navy 35011 'General Steam Navigation' in its post 1962 condition. At this point the afternoon became interesting as two of my locomotives 35028 ‘Clan Line’ and 35027 ‘Port Line’ appeared on the visiting Blue /Grey Mk1 set. Except one of our modelling circle had been tactfully lobbying me to part with them and I’d agreed to sell both at lunchtime! So, they were mine no longer but this was not a difficult decision. Not only did both models sport post-1962 red-ground nameplates they also carried electrification flashes which placed Clan Line as 1966-on and Port Line in the current preservation era. Yes, electrification flashes can be removed but I still have too many Merchant Navy locomotives as it is and somebody else was keen to enjoy this pair. But the day finished with one last twist as I also have 35026 ‘Lamport & Holt Line’ (with black-ground nameplates) so this was placed at the very head of the formation………. I hope these will have been of interest! All photographs are copyright of ‘Caiptean’ at BloodandCustard.